Do you plan to hop on the SMART train and need to know where to park? Check out SMART Parking Information. 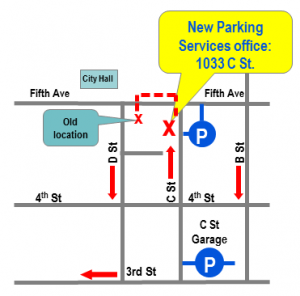 The Parking Services Division office has moved to it’s new location at 1033 C Street. The Division’s business hours remain the same, open Monday through Friday, 9am-4:30pm. The move was necessary in order to make way for the construction of our new Public Safety Center. The parking lot previously located at Fifth & D Street is now closed to the public effective September 11, 2017. Parking is an integral part of life in San Rafael. Not only do our employees interact with people every day, but parking is part of the life blood of a city, and no city can be successful without sufficient parking capacity and a clear perspective on how best to manage it. Our division provides safe and convenient parking with prompt, courteous, and professional service. We are a one-stop shop for all your parking needs, including payments, appeals, and requests like abandoned vehicle tows and meter bag reservations.